. . . by Bree Clarkson. 1- For the most part, freebies are a good way for designers to get people to come to their store and look around. If customers like what they see at the site, they are more likely to come back. This not only increases the chances of sales, but also allows visitors to see what a designer has to offer, such as a gallery or forums where they can be inspired. If the freebies are being hot-linked or shared off-site, the designers have lost the site traffic, and the benefits that come along with it. 2- Many designers have the ability to find out how many times a freebie (or pay kit) has been downloaded from their site. This helps them know what is popular, what people like or dislike, and helps them make future decisions when designing. If people are being directed away from the site the original freebie is hosted on, a designer’s information and records aren’t truly correct. 3- I have seen this happen time and time again . . . daily downloads. Download the pieces one by one and by the end of the week or month, you have a full kit. So, what’s wrong with sharing the pieces? Well, designers reserve the right to remove their freebies from their site and do with it what they want. With the daily downloads, I’ve seen designers either remove it completely from the site, or put it up in the store for sale. Having the freebies passed around after their completed time frame undermines that right. Think about it…if you knew you could go to XYZ group and get the kit that designer A is now selling after offering it as a freebie and you missed it . . . would you go buy it? Likely not. And that’s why it shouldn’t be shared at all . . . the designer offered it for a limited time only, and they have the right to keep it that way. So while it might not seem like such a big deal if you share a freebie or two . . . think about how much work went into that little freebie. It’s a marketing tool, it’s a thank-you to customers, and it’s a gift. What do you do if someone asks you about a certain freebie you’ve downloaded and used? Direct them to the site where you got it of course! There’s nothing wrong with that! It’s easy to say “hey . . . check out this site . . . they’ve got some great freebies.” But it’s not OK to find a pirating ring, join, then illegally upload to a hosting site to share with others. Any kits/elements you download should be downloaded ONLY from the original designer or a site she is affiliated with – if not, it is pirated!!! In my experience (which is a lot, lol…I’ve been digi scrapping with everyone else’s creations for well over a year), designers are some of THE nicest people around. Don’t forget to send them an email when you download a freebie that you really like, and say thanks! Then spread the word, and direct people to the site where they can find those freebies. Now, let’s get back to scrapping, and using up some of those digi supplies! Thanks for reading this article, and I hope that it’s helped you understand why we shouldn’t be sharing freebies! I am a photographer just getting started with personal digital scrapping...the first grandchild arrived! I am also exploring how I could use scrapping elements in my photography. 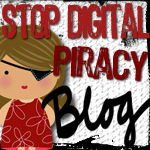 Whether it's photography or scrapbooking, pirating is a big problem. We photographers face the scanner as well as the right click pirates. I do know there are a lot of folks who are "innocent." They have not been educated and feel once they purchase something or have their picture taken and a copy in their hands that it is then their property to do what they like with. Licensing, use, etc. These are concepts we all need to educate the public on. I like what you are doing and your warning/educational kits. I am wondering if your TOU would allow me to use them as well with my photographs? Thank you for taking the time to explain in layman's terms exactly what piracy is. I am glad you posted this on your blog. Thank you. One thing that is confusing in your site is that you use "share" instead of what it really is - collecting and redistributing from your site and/or sending out the actual file. As you say later on, on this page, it's ok to send a link TO THE ORIGINAL SITE. A lot of people, especially those new to digital graphics read this blog as it's linked by many yahoo groups as well as web pages and other sites, and after reading it say... "I can't share a link to the blog I just found?" The answer to that is yes. You may share links to the blog post, or the main blog. Never send a link to the blog owner's file, and unless the blog owner says it's ok to, you shouldn't send a preview of the kit - that graphic is copyrighted also. When a kit maker releases a kit that is free to distribute via email, they will tell you - and you must make sure that you send the entire file, including those pesky text files. Thanks for this. As a long time paper scrapper, who has "converted" to digi, I have been showing friends and family the joys of the digital version. A few had asked me why they couldn't copy the free stuff I had gathered and I had said "because its piracy". For me, if I had been asked not to pass it on that was reason enough, but a few people didn't understand "how it would hurt", now I can direct them here. Thanks for putting this in plain and simple terms. Education is always a powerful agent of change. There is Freebie Bloggers website, that advertises freebie kits & there is yahoo groups, that send links to these various blogs. My thoughts were that if it was free, then why isn't it freely given. In this world, nothing is free @ least not in the freely given sense. I had trouble understanding the Piracy issue. I couldn't understand that if it was free, then why is it Piracy. So, I googled: Free Digi-Scraps Vs. Piracy & came across your site, which explains it in clarified terms. Thank you, I needed this subject clarified. Thanks for sharing this with us. I have just recently started designing for digi-scrapping and agree that a lot ot time and effort goes into making the freebies that we offer. I want to understand about piracy of digital images. Something you said about finding your's and other's images online for sale concerns me. I have downloaded free images, used them to make a card that I then sell to people I work with. Is this piracy? If so, then I will not be doing that again.